FIG and UN-Habitat/GLTN (Global Land Tool Network) have launched a new decision-support tool for land administration to assist the modernizing the budgetary approach. UN-Habitat/Global Land Tool Network (GLTN) and FIG have published a new report. 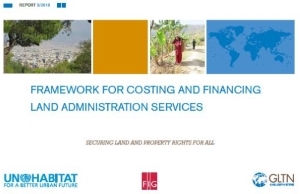 The costing and financing of land administration services (CoFLAS) directly addresses one of the 18 core land tools identified by GLTN: “modernizing the land agencies’ budgetary approach”. It is essential for FIG, as a long-term partner of GLTN, to steer and involve in the development of tools together with GLTN and other GLTN partners. FIG Honorary PresidentTeo CheeHai has had a central convening and leadership role from the first initiative until this final report. The guide provides a practical implementation guide that accompanies the overarching Framework for Costing and Financing Land Administration Services (CoFLAS) tool document. The development of the CoFLAS tool involved comprehensive case research work and extensive consultations. The first Experts Group Meeting (EGM) was hosted by Kadaster in Rotterdam, Netherlands in May 2013, followed by another EGM which was hosted by Lantmäteriet in Gävle, Sweden in October 2013. The first version of the tool was released at the FIG congress in Kuala Lumpur in June 2014 and validated in another EGM in Bangkok, Thailand in October 2014, organised by FIG. These milestones further triggered a series of consultations and validation exercises by the various land experts and members of the Advisory Group. that guide decision making related to land reform, identify the cost-implications of decisions and support fit-for-purpose approaches. The Global Land Tool Network (GLTN) is committed to promoting pro-poor land policies, legislative processes, land administration systems and procedures. The outcome of a CoFLAS assessment is a series of reports that guide decision making related to land reform, identify the cost implications of decisions and support fit-for-purpose approaches. This Framework provides a practical implementation guidance for implementing land administration reforms particularly in developing countries. Kadaster (the Netherlands), Statens Kartverk (Norwegian Mapping Authority, Cadastre and Land Registry), Lantmäteriet (Sweden), Danish Geodata Agency and Land Information New Zealand (LINZ) have provided valuable political and technical inputs in the development of the framework. Authors of the final version of the tool book are Tony Burns and Kate Fairlie, Land Equity International. FIG would like to acknowledge Teo CheeHai for the substantial work he has provided over the years, both during his term as President of FIG and hereafter in the development of this tool that has now been published. A special thanks to GLTN staff, other partners, FIG representatives and participants at the expert group meetings for the fruitful and inspiring cooperation over the years on the tool. It is the hope of FIG that this tool will be used by many around the world.